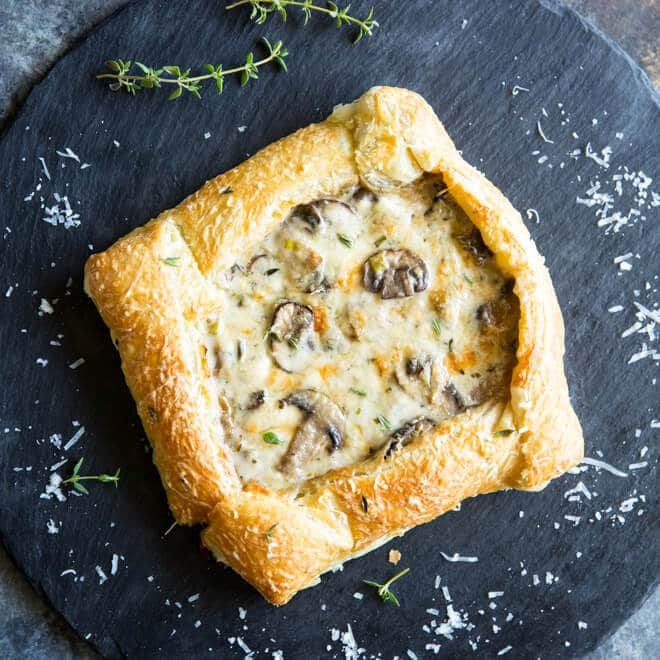 I teamed up with the Wisconsin Milk Marketing Board and EatWisconsinCheese.com to bring you this Mushroom and Leek Tart! I’ve been compensated for my time. All opinions are mine alone. 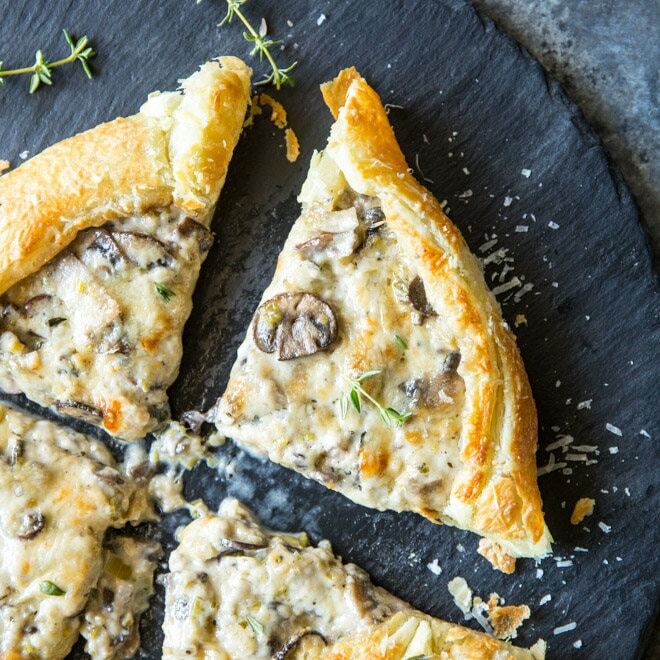 A soft and buttery puff pastry crust makes this Mushroom and Leek Tart the easiest around! The filling is extra cheesy and delicious, too. If you like mushrooms, you are going to freak out over this Mushroom and Leek Tart. It might be one of the best things you ever eat. True story for me! 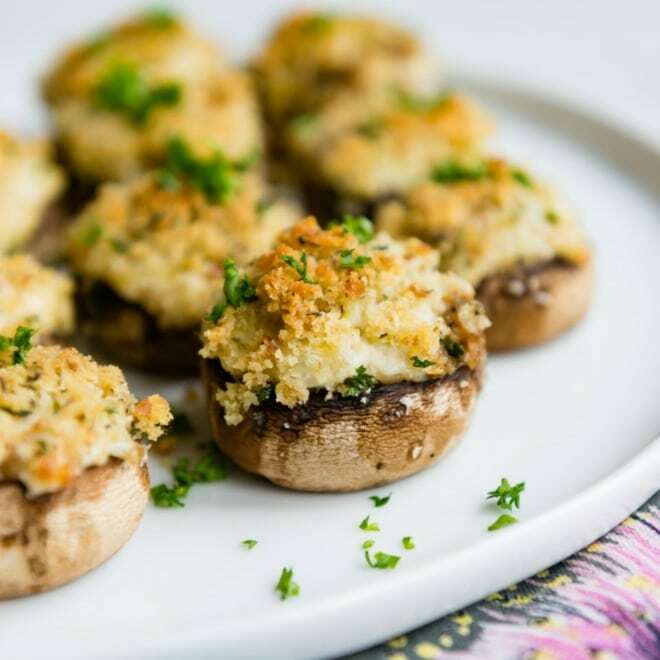 And if you despise mushrooms to your core, just know that the recipe is solid and you can leave out the mushrooms or put something in their place. This is another one of those Culinary School Recipes. We made it in Knife Skills last fall. Except I used a lot more cheese, and I used Wisconsin Cheese, because that’s how I roll. Speaking of which – I was just IN Wisconsin last week touring cheese plants, dairy farms, and breweries. It was all that I hoped it might be and more. Being a Wisconsinite myself, it’s easy to adore the cheese there. It’s in my soul. But seeing the Master cheesemakers at work, hearing their stories, and tasting their cheese, my appreciation has positively skyrocketed. Their pride is palpable. Their talent is undeniable. Their passion is inspirational. Oh, and they love their cows. Wisconsin cheesemakers seek the best milk from the happiest cows. The cows are treated like pets. I met a 6th-generation dairy farmer, a girl about my age, and I could just tell how much she loved her life. And her cows. For me, seeking out and buying Wisconsin cheese, even in California, is a no-brainer. I think you’ll be able to taste the difference. 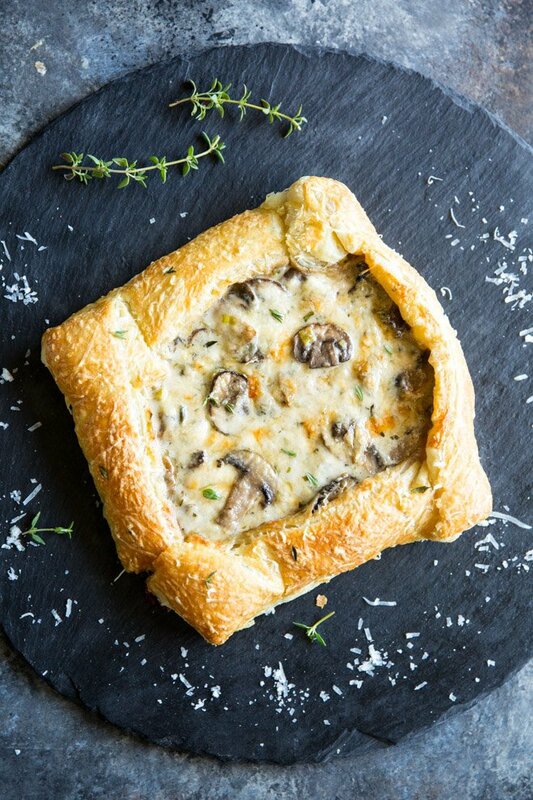 In the Mushroom Tart, I used both Wisconsin Havarti and Wisconsin Parmesan. 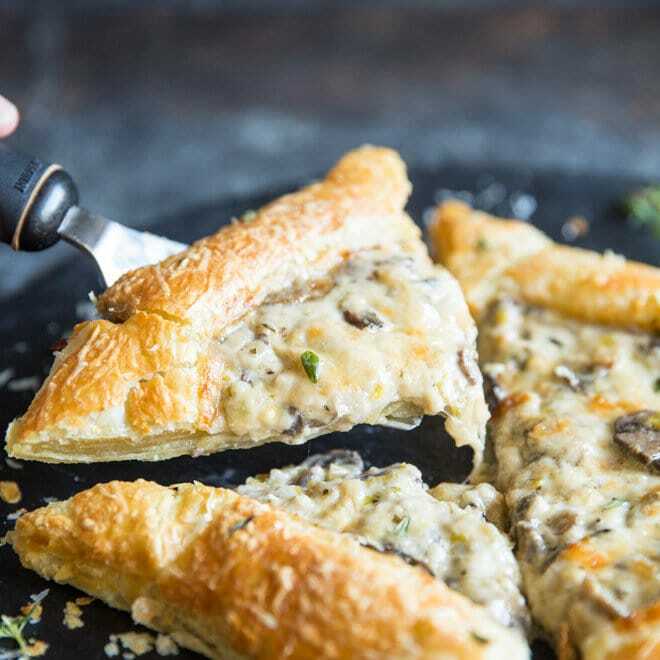 Along with the leeks, mushrooms, and pillowy puff pastry, this is one tart you won’t be able to pass up. Leeks are farmed by pilling dirt and sand on top of the plant to try to have as much “white” area as possible. That’s why leeks get so dirty inside. If you hate mushrooms, you could add squash, bell peppers, even cooked potatoes. Or meat options: Leftover ham, thinly sliced steak, pulled pork…. whatever sounds good! Just be sure to sauté the mix-ins the way the recipe directs for the mushrooms. Save this Mushroom and Leek Tart to your “Main Dishes” Pinterest board! Arrange an oven rack in the middle position and preheat the oven to 400 degrees. Line a rimmed baking sheet with parchment paper or a silicone mat. In a large saute pan, melt butter until foaming. Add leeks and mushrooms and saute until tender, about 10 minutes. Stir in the garlic until fragrant, about 30 seconds. Add 1 teaspoon of salt, 1/4 teaspoon of freshly ground pepper, Havarti cheese, thyme, basil, and the heavy cream. Bring the mixture to a boil and stir until the mixture has thickened, about 2 minutes. Season to taste with salt and pepper. Remove from heat and cool slightly. Unfold both sheets of puff pastry and place on prepared baking sheet, leaving space between them. Spoon half the cheese mixture onto the middle of each sheet. Fold the edges over to form the rim of the tart. In a small bowl, whisk the egg and water together to create an egg wash. Using a pastry brush, brush the edges of the each of the tarts. Divide the Parmesan between the tarts, sprinkling it over the top. Bake until the pastry is deep golden brown in color, approximately 20 to 25 minutes. Cool 5 minutes. Serve warm or at room temperature. 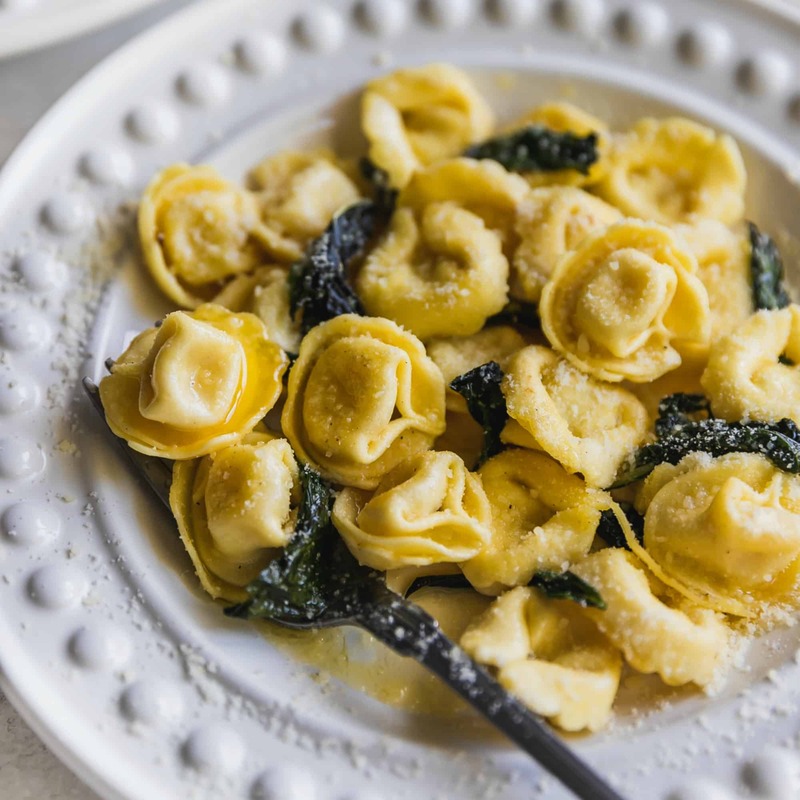 This sounds rich, buttery and yummy! I love leeks. These are delicious! Great for a snack or even a whole meal! I can’t wait to try the cheese and leek tart. I made the crab stuffed mushrooms. I have made them 3 times already and also took it to a party to be used as a dip with water crackers and chunks of pumpernickel bread. I found excellent real lump crab meat and use that every time. Thank you for a great receipe! It’s quick , the ingredients are wonderful and everyone loves it. Cheese. I love Wisconsin cheese. Sometimes I can get it and sometimes not. So any suggestions would really be helpful if I can’t find that cheese. Thank you very much.